Just over 8 years ago my second baby, first little girl, was born. We were so excited to add a baby girl to our family and had no idea how much her birth would change our world. With my first baby I don't think I even realized that they that they did newborn hearing screenings because he had passed his, I don't think I realized it until the nurse walked in with my newborn baby girl and told me that she hadn't passed. We didn't really know what that meant, they didn't really know what that meant. They told us that lots of babies fail right after birth because of fluid in their ears so we should just come back in a week, retest her, and chances are she would pass. The only problem is she didn't pass a week later, or the next week, or any of the times over the 2 months that we took her in to have her hearing tested. By the time we finally got some answers and a diagnosis we were more relieved to finally know what was going on than anything else. She was diagnosed with a moderate hearing loss in both ears. 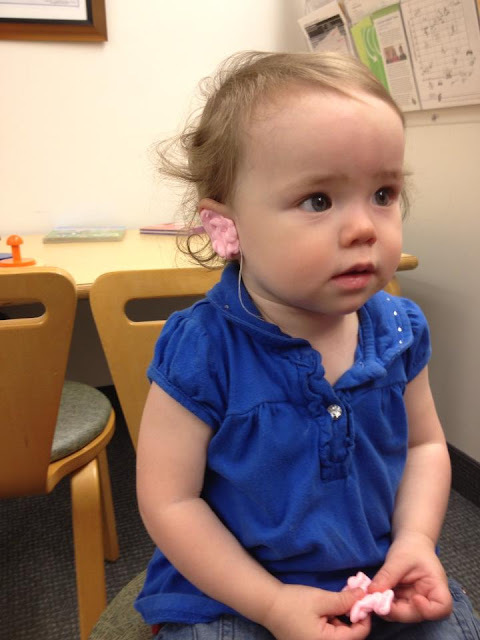 Further testing revealed that she had a progressive hearing loss and would most likely eventually lose all of her hearing. While we were trying to figure out what was going on with her we started to worry about our almost 2 year old son because he wasn't talking yet. We took him in for testing as well and about a month after Eliza's diagnosis Johnny was all diagnosed with hearing loss but unlike Eliza he was already profoundly deaf. We found out that both my husband and I are carriers of a genetic mutation that can cause progressive hearing loss and each child that we had would have a 25% chance of being deaf. At first it kind of felt like our lives had been turned upside down. We had to make decisions about language, hearing aids, cochlear implants, ASL, speech therapy, education options, and all sorts of other things that I knew nothing about. Not to mention all of the doctors appointments and tests, audiology appointments, and early intervention visits. We started to learn ASL in any way we could. My husband was still in school so he took some classes. I had a deaf mentor come to our house weekly, and we began attending an ASL church group. It was so overwhelming at first. Learning a new language so that you can communicate with your kids is not an easy thing. But after a while we started to become more and more comfortable with it, and were able to communicate with our children through ASL. It became a huge blessing for out family and it was amazing to see how fast the kids picked it up. A few years later our 4th baby was born and when we found out that she was also deaf it wasn't really a big deal, just normal life in our family. 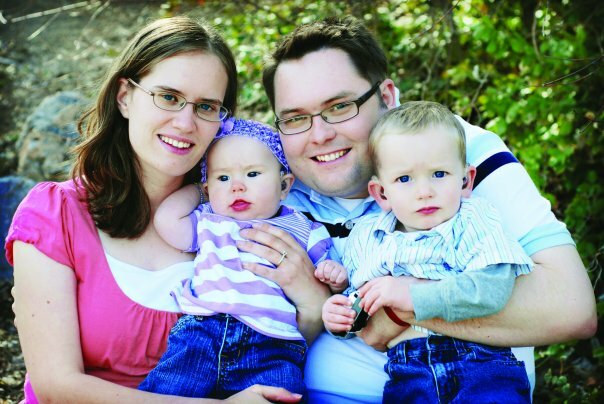 Now a couple of kids later our family is nice and even, 3 deaf, 3 hearing, 3 girls, 3 boys. One of the first signs that we learned and started using was the I love you sign. 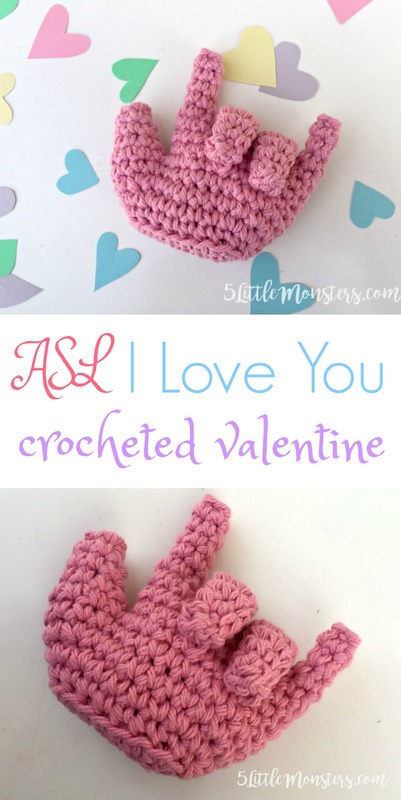 When I was trying to think of a project I could make for Valentine's Day I wanted to come up with something that wasn't hearts because I made some crocheted puffy hearts last year, I have made little crocheted heart ornaments, I even just made a pillow with hearts on it. 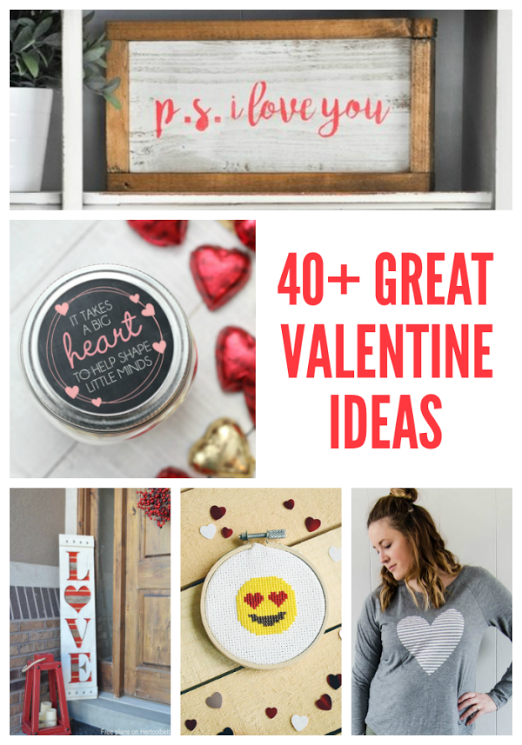 I wanted to make something that represented love that wasn't hearts and the I love you sign popped into my head. I decided I was going to try to figure out a way to make an I love you hand. So I picked up a crochet hook, a ball of yarn and I got to work. 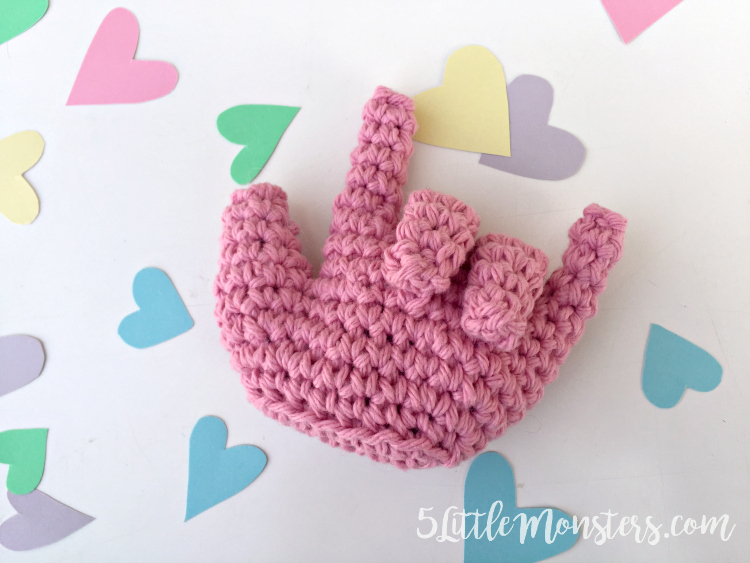 It is a little trickier than some amigurumi type projects because you have to work each finger separately. I made mine with cotton yarn but any worsted weight yarn would work. It is lightly stuffed with Poly-Fil in the hand and thumb. If you want to make the hand into an ornament you can add a string to it at this point. Thank you for sharing this pattern and the story behind! I tried it and it looks great. 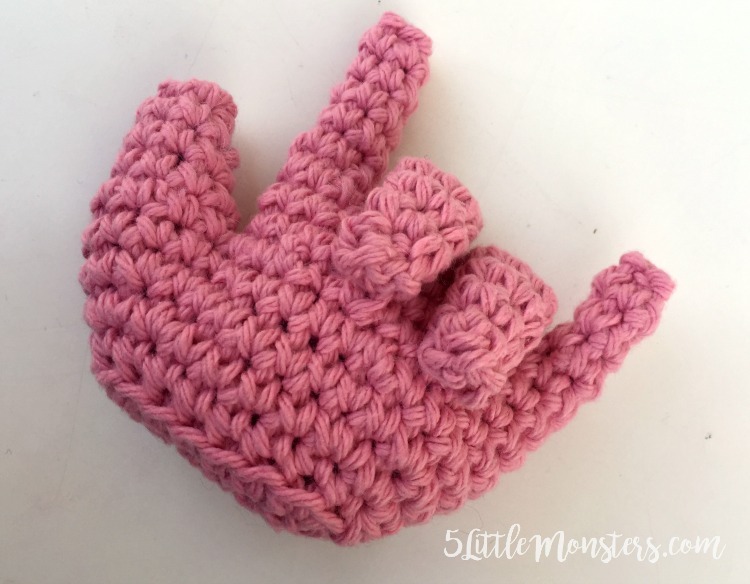 While crocheting I noticed that instructions for the thumb are at the end of the pattern. 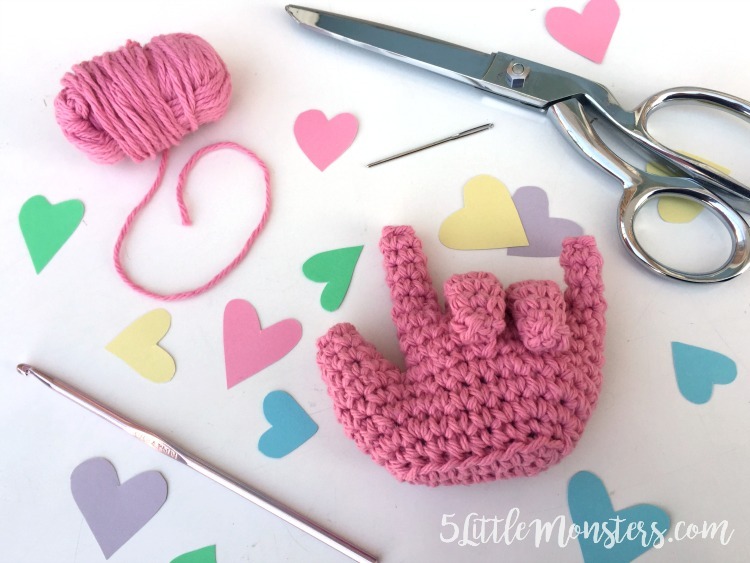 Wouldn't it be easier for stuffing to make the thumb right after the pinkie? I will try another hand soon but with one more row of 20 sc after row 3 - in BLO for creating a nice edge. What do you think? This is so cute! Thank you for sharing as part of the blog hop. I really love this. Such a fun project. 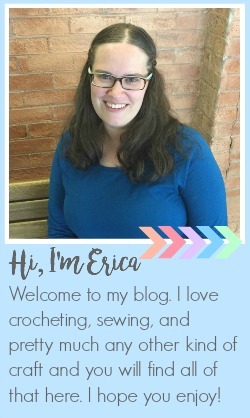 It makes me want to pull out my crochet hooks! Thank you for this pattern! I'm going to make one for my sister. She's Deaf and I'm sure she'll love it.